The fields are alive with blossoms. Here, looking north towards Cougar Canyon in the far distance. 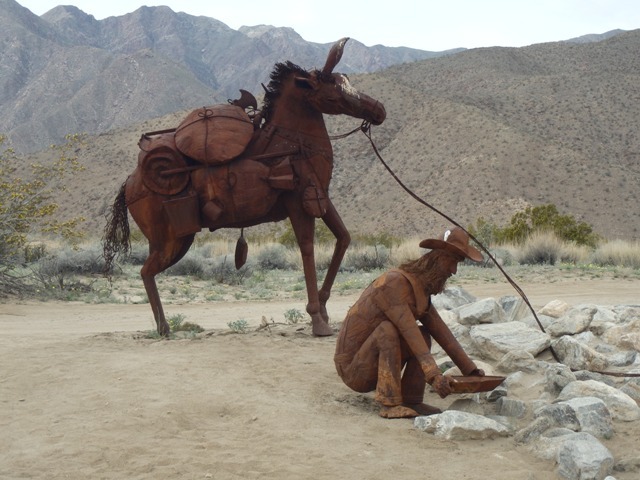 Editor: In the hopes of encouraging beach people to drive east and view the flowers and animals of the Anza Borrego desert, we re-post this from 2015. It’s OB Time again. 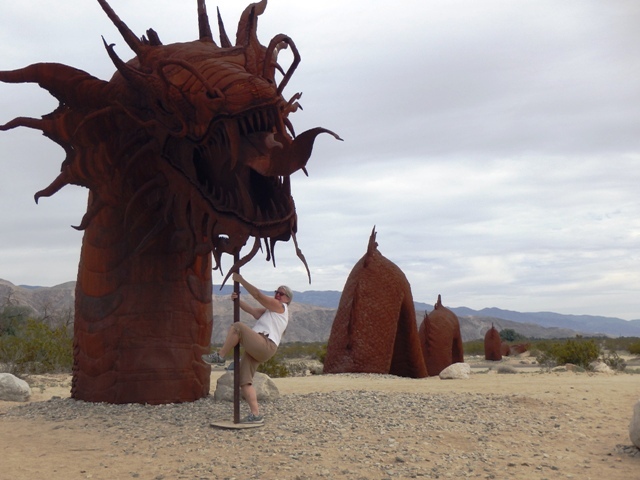 Tagging along with the OB Rag crew on their Borrego Springs R & R sojourn, your old OB hippie discovered some amazing things about our own San Diego desert backyard. The desert flowers are blooming! After recent rains in the desert, everything is going green and bonkers. But that’s not all. We were lucky to enjoy the arrival of hundreds of Swainson Hawks, to witness thousands of Sphinx Moth caterpillars, and to appreciate the “Sky Art” of ancient dinosaurs and other animals that once roamed the grassy plains of this area millions of years ago. 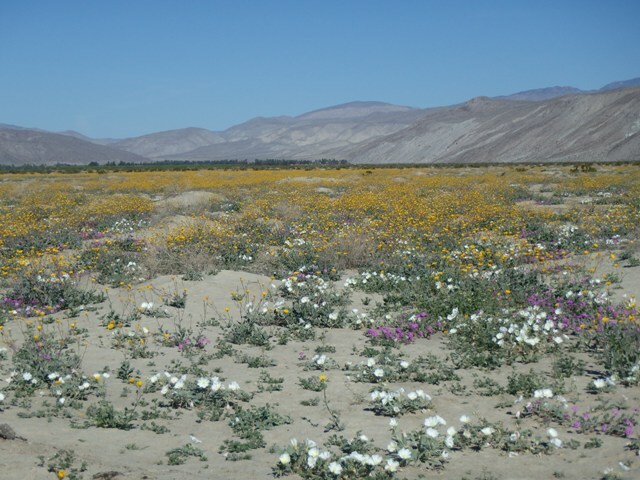 Yes, the big news from Borrego is that the flowers are blooming. The storms that blew through OB and the rest of San Diego County over the last couple of weeks also hit the desert and the mountains. Julian, for instance, got 2 and half inches of rain in one day. But the blossoms of all the tiny plants, the bushes and vegetation are unfolding in all their brilliant yellows, whites and purples. So, drop your other plans and get out there. One particularly great area was north of the town along a east-west road. 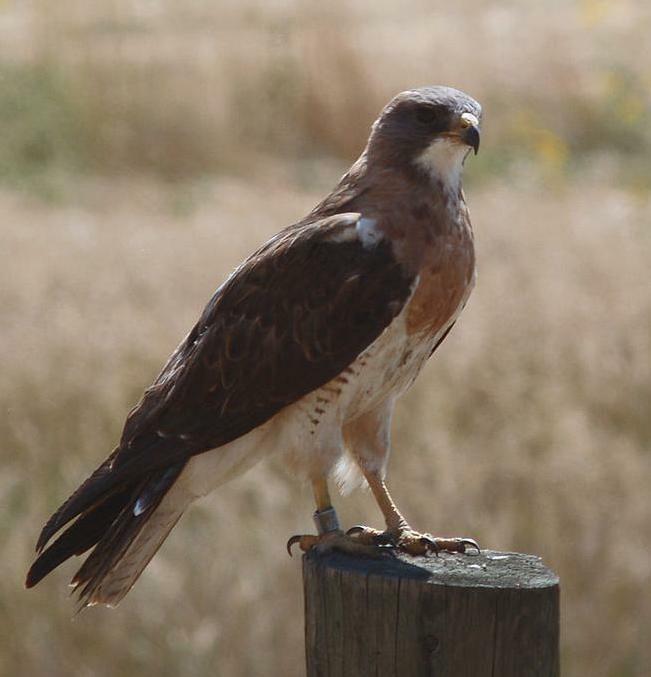 Next, we were all so fortunate to arrive in Borrego Springs just as the migration of Swainson hawks came through from South America. There’s a local Hawk Watch group and they informed us when and where we should gather to watch the hawks. They counted over 300 the day before we arrived. Once at the chosen roadside location next to large fields, we were told they were full of hawks. We whipped out our binoculars – and sure enough, dozens of Swainson hawks were sitting out in the field – at one point I counted over 30 across a wide swath of sandy arid ground. Occasionally, one would fly up and settle back down. The hawks were in the field to have their breakfast, lunch and dinner – they were munching on the literally thousands of Sphinx Moth caterpillars that had all just hatched and were moving around looking for their breakfast. 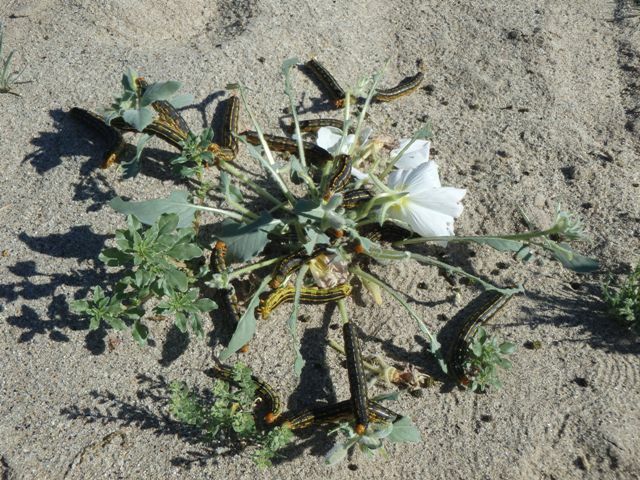 The caterpillars were everywhere – all over the roads too – and they were devouring some of the desert flowers and plants, all the while the hawks were munching on their brethren. Here, the Sphinx Moth caterpillars attack their favorite breakfast meal. We were told by locals that they hadn’t seen such a hatching of these type of caterpillars for a decade and that this was indeed a rare event. Hundreds of these slithering and ugly looking creatures were being squashed as they crossed the asphalt roads. Later at sunset we returned to watch the hawks fly up into a kettle and then flap over to a few tall trees nearby to rest for the evening. The other amazing thing we experienced was seeking out all the “Sky Art” – the sculptures of mainly ancient animals by Ricardo Breceda. 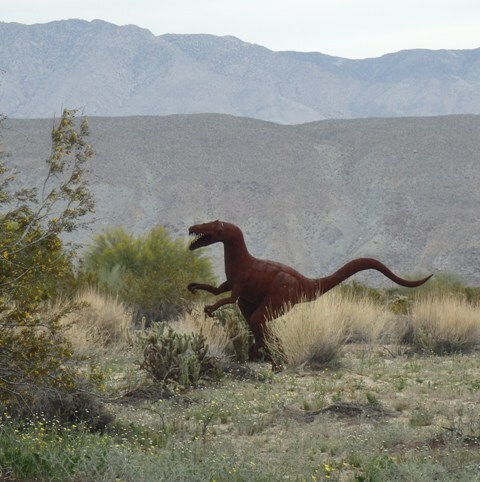 These are amazing life-size metal creatures that Breceda has created and installed throughout the Borrego Springs Valley. 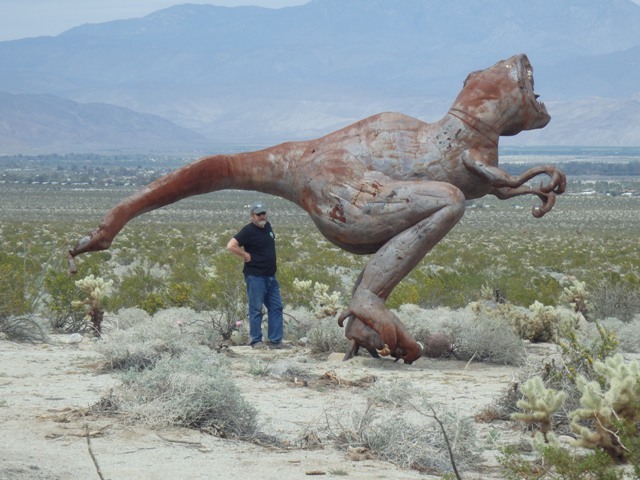 Nestled among the rocks and cacti you’ll find his raptors, wild boars, saber-tooth cats jumping on wild horses, mammoths, giant birds, camels, sloths, and other dinosaurs. 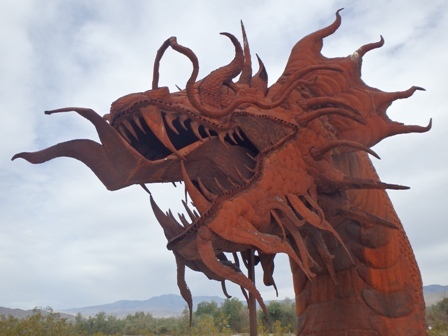 They’re all not just ancient animals that roamed this area 1 to 5 million years ago, as Breceda has also sculpted a huge serpent that crosses the road, grape-picking farmworkers, an old cowboy panning for gold, and nearly a dozen bighorn sheep. Patty Jones, the OB Rag tech girl, dances to the Serpent. If you haven’t experienced this truly inspiring sky art presentation by this amazing sculptor, now you have two reasons to ride out east before it gets too hot. Editordude takes a break beneath T-Rex. It’s not that far away – 50 minutes to Julian, and another 45 minutes to Borrego Springs. Get out of OB! Get your bones out to the desert – find the mighty Serpent – pay homage and tell it that you’ve been good, trying to make the earth a better place. And tell ’em the ol’ OB Hippie sent you. thank you, old hippie, for being willing to trip through life with us. always one of my funnest things when I lived in OB in the ’70s: the flowering of the desert in early spring. Thanks, for the memories, Ol’ Hippie . . . good to know it is still happening. Has anyone been to check out the flowers this year? I’d love to see their report. Btw I’d like to give a shout out for a great way to learn more about desert flowers and Anza Borrego in general. It’s too late this year, but the park offers a FREE curriculum called the Botany Society Certification Course starting every January. It’s an amazing class taught by amazing volunteers. The idea is you learn about native desert plants, and in the process, the geology, history, etc. of the region, and become able to volunteer to help out with hikes (which are also free). My girlfriend and I are over 50 but we were among the youngest in the class, and we learned a lot from the old-timers. great reminder of the many blessings & eco-biodiversity we enjoy here in so cali. By now – early April 2017 – most of the flowers at the bottom of the desert plain are dried up, but the hillsides are bursting and exploding in color.